Here's a beta version of Sweet Home 3D 4.5. - Spanish, Portuguese Brazilian and Japanese help translations were updated. Many thanks to Carlos Segura and Chiyoko Miklasevich for their contributions to these translations. - Loader3DS library was replaced by the new class Max3DSLoader I programed (thanks to lib3ds authors for the inspiration, and many thanks to Loader3DS author that was so helpful during the past years). From my tests, this new class is up to twice faster, interprets better colors in 3DS files and is able to ignore the case of texture file names bound to a 3DS file. I tested this new 3DS loader against many 3DS files (mostly the ones coming from Archibit Generation), but miserably, it's still not able to interpret correctly 3DS files that contain scattered shapes like many ones available at Model3D.biz (like this model or this one). I think in many cases, these files are simply buggy and I fear you can't hope anything better. Nevertheless, I would be pleased to read your feedback about your own tests trying to import 3DS files in this new version. If you encounter some 3DS files that used to work correctly with previous versions of Sweet Home 3D, but that are refused or buggy with this new version, please give the URL where it can be downloaded or simply send them to me. Here's already the Beta 2 that fixes an issue that could happen in Furniture materials dialog box, when colors list read by the new 3DS loader is different from the list read by previous loader. By the way, changing loader implies in many cases that the customization made on the materials of furniture read from 3DS models will be lost. Hope you won't mind too much about this incompatibility with previous versions of Sweet Home 3D. Thank you once again for the update!! On this page try the model called Trees 9. When imported with v4.4 the model is OK and shows 9 trees. When imported with v4.5b the 9 models are all centered around the same X,Y coordinate. 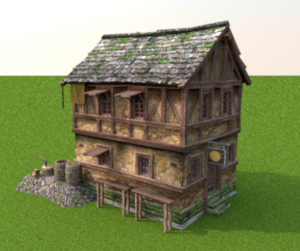 This model of an old house also gives problems, even though the textures are included in the file. In this case not only the 3ds file, also the OBJ file is i ncorrect. Maybe the textures are used in a way SH3D doesn't support? This simple chair suffers the "old" displacement problem in both v4.4 and v4.5b. Although there are no textures, they are defined and can be changed using Modify Materials. This modern closet doesn't import in v4.5b, but it does import in v4.4, although without textures or texture groups. The OBJ model does import correctly. Maybe this model was "translated" through an incorrect converter? Interestingly... the SH3D file is also included. Maybe you can find out who made the model and ask the designer how he/she converted the model? Thanks Hans for your detailed feedback. I updated the Beta version to improve 3DS loading. I didn't fix the issue with the Tree 9 model yet. I wonder from which part comes the coordinates that place the trees… Blender itself keeps all the trees centered at the same place. Are there any other users who could try to import that file and see how the tree models it contains are located? The textures of the old house are not rendered because they use the TIF format that Sweet Home 3D / Java doesn't support at this moment. As I saw that some other recent models use this file format too, I wonder if it could worth to add support for it. Just don't want to make the program grow too much and add a dependency whereas I just remove the one to Loader3DS! I think the issue in the simple chair is typically one that comes from the file itself. The human models of Reallusion use the same kind of textures as the old house model. They wrap around the model in a specific way. Maybe there is a workaround possible? I am vary glad to see that SH3D going to release v4.5. On this page try the model called Trees 9. When imported with v4.4 the model is OK and shows 9 trees. When imported with v4.5b the 9 models are all centered around the same X,Y coordinate. Hans is right. When importing some grouped objects it become centered. I think already reported this issue. It happens both obj and 3ds format. Suppose if two objects have same pivot location like object_2 have pivot located at 0,0,0(x,y,z) and object_6, pivot located at 0,0,0(x,y,z) but both have different positions in view port/drawing then it imported to SH3D it become overlapped. but it needs to be arranged in this way. In 3dsMax, for grouped objects when it is exported this bug does not affected while re importing and the groups become ungroupes automatically. In my opinion SH3D require some more script that locate the object based on pivot and this pivot arranged based on grid positions. Hope I explained it properly. If you don't get what I mean let me know. I am ready to explained it more. If jpg can import as tif then why HDRI can't import. Waiting for HDRI support as Modify 3d view -> Sky(Texture). I am very much interested to know current progress of yafaray code conversion. sree.arun.kr, I don't want to add support for a new format, I want to replace the existing library that loads 3DS files by one I programmed myself, so it's easier to maintain. I'll look at the pivot feature and hopefully will fix the new 3DS loader. If jpg can import as tif then why HDRI can't import. You misunderstood my trick: Sweet Home 3D doesn't support TIFF, it's just able to read any file containing some data at JPEG format, even if its extension is .tif or anything different from .jpg or .jpeg. It was tough but I think I was able to resolve remaining issues in 3DS support. At least, Sweet Home 3D should be able to import models as well as OBJ models converted with FBX Converter. Please, test it in the last Beta version. Yes.The pivot point issue fixed.Thanks for the update.